A couple’s dream of running an airline and the opportune resignation of a former general manager of Polynesian Airlines has led to the launching of the newest airline to fly between Samoa and American Samoa. Talofa Airways introduced itself in the territory this afternoon with a launching and blessing at Pago P ago International Airport. 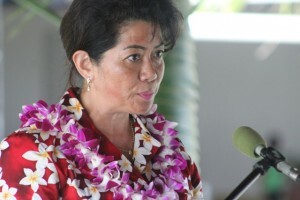 It brings to reality a dream of Toleafoa Jeffrey Hunter and his wife Maria, who were looking for a finance expert to help with their airline just when Taua Fatu Tielu was stepping down as Polynesian Airlines CEO. 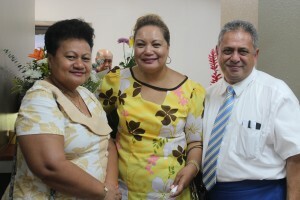 The three and Taua’s wife joined forces to form Talofa Airways. 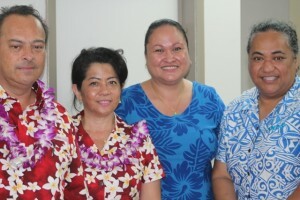 Before a ribbon cutting at the airline’s office in what used to be the SPEX office at the airport, a small group of government and business officials and relatives of the owners attended a prayer service in the airport fale. Mrs Hunter emceed the ceremony. Lt. 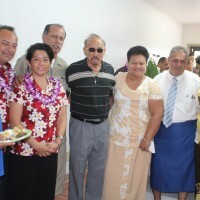 Governor Lemanu Peleti Mauga, Rep. Su’a Alex Jennings, American Samoa Visitors Bureau Director David Vaeafe, CEO of ANZ Bank, Joanne Rasmassen, and ASTCA CEO Alex Sene were among the guests. 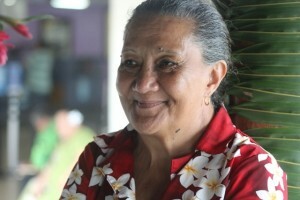 Taua Fatu Tieulu who is the Chief Financial Officer for Talofa Airways was also present. 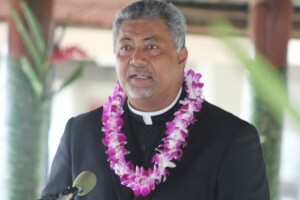 Chancellor of the Diocese of Samoa Pago Pago Fr. Kelemete Puaauli asked for God’s blessings on the new venture and also gave advice on being patient and treating customers with care. Talofa Airways CEO Toleafoa, who is also chairman of the board and Chief Pilot, has over 20 years of flying experience in the region. He spoke about the arduous process they went through to get to the launch and why they decided that the 9-seater Twin Commando aircraft was the right aircraft for this market. Lt. Governor Lemanu jokingly referred to Toleafoa as the 3C’s…wearing the titles of CEO, chairman of the board and chief pilot and also wondered why members of the Swains/Tokelauan community were there. Toleafoa’s mother is from the Jennings family, from Swains. Kidding aside, Lemanu said though this was a commercial venture, it is a public service nonetheless and one that the two Samoas needed. In that sense he said the airline should be based on family values, and taking care of individual members. The guests then toured the newly renovated office of Talofa Air, which was done in just four days by Craig Construction. Guests were treated to refreshments bfore they went on the tarmac to try out the new aircraft.